E(dward).W(ilfred).Fordham was, a barrister aged 57 in 1931, when he first won. (His father and elder brother were also barristers.) 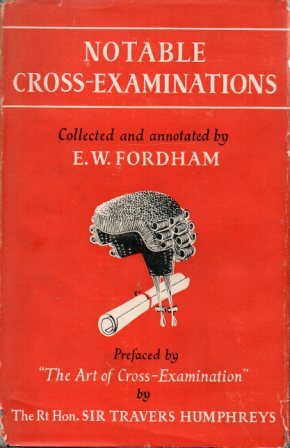 He lived in Hampstead, and wrote a book in 1950 called Notable Cross-Examinations. Shortly before that he’d joined in a debate on instances of ‘literally’ in a running correspondence (April 1949) in The Times: Sir, Perhaps the most picturesque use of ‘literally’ was that of a writer who asserted that ‘for five years Mr Gladstone was literally glued to the Treasury Bench.’Yours faithfully, E.W. Fordham. The next letter in sequence is from Gerald Barry! He married Sylvia Harriet Langdon-Davies in 1898. He had five children (one of whom died in childhood). One of his sons was the defending barrister in one of the Train Robbery trials. Fordham died in 1956, at the age of 81.